anyways, i hope you like it megan! i drew it just for you! Why would we kill you? This is definately some of your best work...hell, it's some of the best work of Dante I've seen! Well done. I'd love to see more stuff like this. I'm not so good with crayons, but you rock at using crayons, I love how you used so many colors and made them blend together so brillantly, anyways excellent work! CRAYON!?!?! 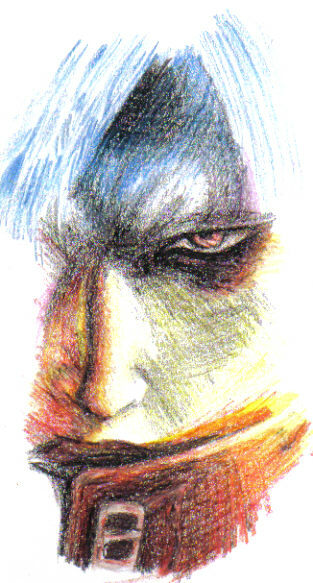 This was done in crayon??!!?! Wow, this is just too amazing. O_O Great work! Haha, I agree with Deathelf, "In bloody crayons?????" lol You do have quite a way with color you know. I can honastly say I've never gotten this level of detail or realistic form and shade with crayons. Its an impressive peice all around. YAY! It's DANTE!!! Thsi is bloody flippin brillaint!!! In bloody crayons????? Fudge man this riocks! I really envy ur artsitic skills. WOW! Thsi is awesome! that's amazing! Who knew that crayons could make a picture look so wonderful! I love your use of red, blue, white, black, orange, and yellow! It makes it look even cooler than just his natural colors!!! !